Prime Minister Abe Shinzo’s visit to the United States drew widespread praise in both Tokyo and Washington, but in both capitals a wary eye was kept on the reaction in Seoul. The visit proceeded in a triangular context. Not only were the media focused on how Japanese and Americans would respond to developments, anticipating a positive outcome, but they also were fixated on the Korean response, fearing a negative impact. Japanese-South Korean relations were improving, especially from 1998 to 2004, and then deteriorated, notably in 2012 to 2014, and many in Japan wonder whether the Abe trip to Washington will exacerbate that tendency—since his language failed to satisfy the demands coming from Seoul—or start a turnabout in relations within a triangular framework as a result of Seoul’s awakening to the strength of the Japan-US alliance and the danger of its own relative marginalization. Relations between Japan and Korea looked better than ever from the end of the 1990s to the first half of the 2000s. After many decades when both countries went through difficulty in dealing with their past, historical issues seemed to be overcome by the Kim-Obuchi communique of 1998, where Prime Minister Obuchi Keizo sincerely apologized for the pain caused by colonial rule and President Kim Dae-jung openly called for overcoming their unfortunate history and building a future-oriented relationship. From this time, there began to emerge in Japan new respect toward Korea, with bright hopes for the future. Korea had reason to be proud of creating a democratic society from the autocratic and military rule of the initial decades of the Korean Republic. The end of Rhee Syngman’s regime in 1960, the rise of the students’ movement after the assassination of Park Chung-hee in 1979 and its brave assertiveness in the Kwangju incident of 1980, and the whole process of achieving the Democratization Declaration of 1987 are powerful manifestations of democratization achieved by their own hands. On the economic front, by the end of the Cold War, Korea had become one of four economic dragons in East Asia, together with Singapore, Hong Kong, and Taiwan. Korea joined the OECD in 1996, and giant companies such as Hyundai, Samsung and Posco began to rise and overtake once invincible Japanese counterparts from this period. After the Kim-Obuchi communique, cultural relations warmed dramatically. The two states co-hosted the World Cup successfully in 2002, and the Korean wave soared in 2003~2004, opening an entirely new image of Korea in Japan. In contrast to Japan’s failed Asian policy in other arenas—China stopped holding a bilateral summit because of Koizumi’s yearly visit to Yasukuni in 2001~2006, Russian policy disintegrated after the Irkutsk Mori-Putin meeting in 2001, and North Korean policy was hijacked by the abduction issue after Koizumi’s successful Pyongyang visit in 2002—, relations with South Korea remained Japan’s only bright hope barely a decade ago. This pleased Washington, but it may have given rise to complacency in both Tokyo and Seoul in the face of mounting regional challenges and deepening internal struggles over national identity negative for this fragile relationship. By the 2010s, however, there occurred several unexpected events primarily on the Korean side that compelled many on the Japanese side to think that improvements in the relationship could have been illusionary. The Constitutional Court’s verdict in August 2011 that the Korean government has not sufficiently protected the interests of the comfort women surprised the Japanese side. More importantly, the Supreme Court’s verdict in May 2012 that the 1965 agreement on claims and economic cooperation has not resolved the issue of enforced labor astonished and chilled the Japanese side. President Lee Myung-bak’s landing on Takeshima and his ensuing statement on a visit by the Emperor to Korea probably for the first time in bilateral relations resulted in greater emotions on the Japanese side than the Korean side. Repeated statements by newly elected president Park Geun-hye to seek exclusive justice from the Japanese side on the colonial ruling aroused a deep feeling of fatigue in many Japanese. After more than two years have passed since Abe and Park assumed their posts, the two leaders have not even had one official bilateral meeting, and the only meeting of note was in April 2014 in The Hague hosted by President Obama. Something is really wrong here. At this difficult time in the relationship, Abe made his visit to America, meeting with Obama on April 28 and giving his congressional speech on April 29, which created the impression of a leader who is capable of delivering. In the kind of exacerbated relations between Japan and Korea, where Abe and Park’s successes with the United States could be seen on a zero-sum basis, Abe’s diplomatic success has been treated as a loss for Korea by some observers of Japan-Korea relations. The focal points of the Abe–Obama summit were security and TPP. Abe’s new defense policy, including reinterpreting the Constitution and establishing new Japan-US defense guidelines, portends a closer, more effective alliance. Abe’s readiness to go ahead with TPP also created the impression that economic ties will play an equally important part in the relationship. The most difficult issue in defense ties—Okinawa’s opposition to moving the Futenma base to Henoko—did not arise during the visit. Some of TPP’s measures are arousing fear that it might damage important aspects of Japanese society, but again these problems did not come to the surface during Abe’s visit. Abe’s speech to Congress maintained this positive note of an enhanced and strengthened alliance. Abe repeatedly emphasized shared democratic values and recognition that from the Meiji Restoration and into the post-1945 era, it was the United States from which Japan learned about democracy. Abe conveyed Japan’s gratitude to for genuine US help after Japan’s defeat in 1945. Abe also stressed the prosperity that democracy has brought to both societies, which can become the basis of peace and future development. 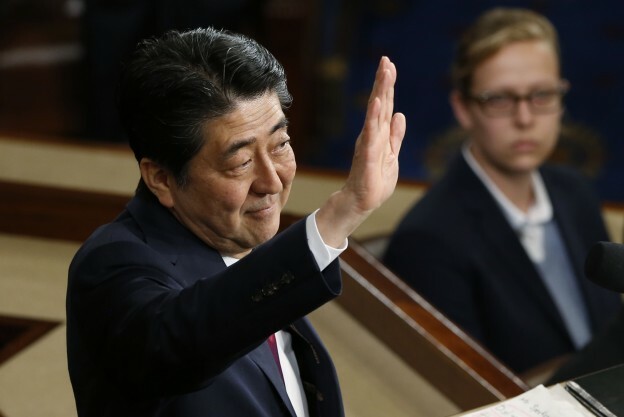 The confident optimism with which Abe depicted a future based on democracy and prosperity injected new dynamism into the relationship, which members of Congress appreciated judging by the frequent standing ovations. From the point of Japan-Korea relations, Abe’s impact on the historical memory issue requires the most serious scrutiny. Here, he chose a very distinctive approach. As in his Canberra speech in 2014, he touched upon historical events that are extremely sensitive to the memory of the country he was visiting, in this case: Pearl Harbor, Bataan Corregidor, and the Coral Sea. Abe described the war memory issue based on his personal experiences, such as the time he spent at the World War II Memorial and the 4,000 gold stars he saw there. “With deep repentance in my heart”, Abe said, “I stood there in silent prayer for some time. On behalf of Japan and the Japanese people I offer with profound respect my eternal condolences to the souls of all American people that were lost during WWII.” Abe did not use the word apology, and his reference to Bataan Corregidor was indirect and did not have the clarity of Ambassador Fujisaki’s statement in 2009. But it is hard to deny that Abe expressed Japan’s humility in his own way. With regard to the war in Asia, Abe stated that: “Post war, we started out on our path bearing in mind feelings of deep remorse over the war. Our actions brought suffering to the peoples in Asian countries. We must not avert our eyes from that. I will uphold the views expressed by the previous prime ministers in this regard.” The unambiguity of upholding Prime Minister Murayama Tomiichi’s 1995 statement, which has served as the official position of all prime ministers over the last 20 years, is unmistakable. Here evaluation may be split. One might assert that the key words of “apology,” “aggression,” and “colonial rule” were not included; therefore, the speech had no value from a Korean or Chinese point of view. But here again, it was hard to deny that Abe expressed his humility in his own way. At least, the speech could serve as an important transitional point towards the critical statement he is intending to make on the seventieth year of commemoration of the end of the war on August 15. In contrast, it was surprising that he omitted any reference to the “comfort women” issue—all the more so because Abe responded at a question and answer session after his summit with Obama that “when I think of these comfort women, who have been victimized as the result of human trafficking and have gone through indescribable pain and suffering, my heart aches. My feeling is the same as my predecessors. I inherit the Kono Statement and I have no intention to revise it”. We certainly know that his answer was not accidental, because when he made his speech on April 27 at Harvard Business School, the same question was asked and Abe responded with exactly the same wording—one of the most constructive statements Abe has made so far on this issue. Abe has finessed his tactics if not his strategy. I assume that he is prepared to take further action to bring about reconciliation on this issue in cooperation with Park Geun-hye. But at this point, Abe may be limiting his public declarations so as not to stir up domestic public controversy. Abe was no doubt influenced by Representative Mike Honda’s speech to Congress on 21 April—one of the strongest statements denouncing Japan on the “comfort women” issue. Perhaps, Abe did not want to be seen bowing to foreign pressure. But he runs the risk of inciting backlash from Korean Americans to pressure Seoul not to make any compromises with Japan. If this happens, it would worsen the vicious cycle between Japan and Korea on this issue. It would be disappointing to see the genuine progress made in the Washington speech erased by clumsiness with respect to South Korea. Particularly, it is disappointing because I have some reasons to assume that the two governments might have a window of opportunity for breaking the knot on the “comfort women” issue. Recognition that the issue needs to be resolved while 50 or so of the women are still alive is shared by many scholars and journalists and some political leaders, including Park, who has repeatedly stated this point. The content of that resolution being discussed among Japanese and Korean scholars is also fairly clear: “A penetrating message of humility, sympathy, and apology, in words and/or action and atonement to be paid by Japan’s budget.” From the Japanese side, there is no reason to think that these are impossible steps. On the atonement, the Japanese Supreme Court verdict in April 2007 gives legal immunity to the government based on the interpretation that postwar treaties do not acknowledge the right for individual claims. This should allow the government to allocate budgetary funds for atonement, an action which the Asian Women’s Fund did not adopt. Abe’s statements at the White House and Harvard Business School should become a good basis for expressing a personal message of humility. On the Korean side, representatives of the Korean Council (Tei-tai-kyo) visited Tokyo, and on April 23, held an important meeting with supporters of the “comfort women” in Japan. They reportedly made public an important new policy that, “although their basic position has not changed, they would not require Japan’s explicit acceptance of ‘legal responsibility’ nor ‘criminality.’” Since it has been long understood by Japanese scholars and NGOs in charge of assisting the “comfort women” that these are precisely the two conditions unacceptable to the Japanese government, this should be seen as a light at the end of the tunnel. Opportunities should not be missed by the two governments. The “comfort women” issue is certainly not the only issue which separates the two countries. At least two other issues: enforced labor and Dokdo-Takeshima are shadowing the relationship. But there is an absolute need to escape from today’s vicious cycle. The fundamentals of the relationship, i.e. changes in surrounding geopolitical conditions, Korea’s confident assertiveness, and Japan’s inability to empathize with Korea’s reaction, will not disappear easily. But there is no reason to believe that, with wisdom and courage, Japan and Korea should not be able to overcome burning issues one by one, and get out from today’s vicious cycle. That may eventually change the fundamentals of the relationship toward a positive direction. Abe’s visit to Washington may have appeared to set back the chances for reconciliation, due to omissions that many in Korea wanted to hear and persistent zero-sum expectations, but when seen in the context of other developments and the overall success of the visit, it could well be part of a win-win process to become clearer when Park visits Washington and, even more so, if quiet bilateral diplomacy succeeds and leads to a Park-Abe summit.